Occasionally a golf book comes along that has golf at its nerve center, but is not totally about golf. Such is Freddie & Me: Life Lessons from Freddie Bennett, Augusta National's Legendary Caddy Master. Freddie and Me is the tale of one man whose life was directly influenced by Freddie Bennett, long time caddie master at the famed Augusta National Golf Club, home of the Masters. The story spans approximately thirty years of Tripp Bowden's life from a young boy of about ten to a grown man with a career and family. It is an entertaining and at times an educational journey that we take with Bowden. 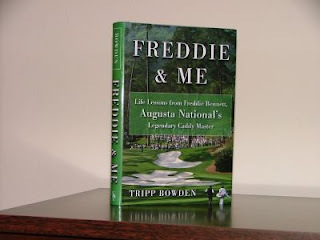 Freddie... is Tripp Bowden's first book. Bowden was the first full-time white caddy at Augusta National Golf Club formerly a bastion for white golfers and black caddies. Today, as a direct result of Bennett's mentoring, Bowden is a stable family man and owns an advertising company. Not every individual who has a dynamic influence on the game of golf is a high profile person securely lodged in the upper echelons of the game. Not every specific agent who has a motivating influence on an individual life is a long on education. Such is the case of Freddie Bennett. In bite-size chapters Bowden gives us snapshots of thirty years of his life and how it was gently guided by Bennett. There are fun and fascinating stories along the way. Throughout this literary journey we learn how PGA Tour player Charles Howell III got his first set of clubs. We are also let in on the secrets of playing AGNC as part of a chapter in which Freddie takes Bowden through the nuances of each hole as part of his caddie education. But the most fascinating instruction we receive are the Freddie-isms, Bennett's bits of wisdom for life. Get ready at the end for a few tears or at least a little lump in the throat. Even though you know the inevitable is coming, you still can't control that emotion. Why is that? It's because Bowden has drawn us into his life and thus Freddie's life. He has made us care about the characters. We rejoice in their successes and mourn at their demise. The question Bowden wants each of us to answer is this: Who is the Freddie in your life? Make sure you answer and thank him immediately after you finish this book.